Oh, hello, artsy types. You’ve come to the right town. In fact, Boulder was named one of “America’s Most Artistic Towns” by Expedia. There’s creativity infused in just about everything Boulder does. Here’s how to tap into it while you’re in town. One of only three poetry cafes in the country, Innisfree Poetry Bookstore & Café is a true hub for Boulder’s poets. Have a seat among CU grad students, unearth a Billy Collins volume from the shelves, and sit and enjoy a bagel and latte. Next, plan to spend a fair amount of time on historic Pearl Street, the heart and soul of Boulder. Watch buskers perform, browse art galleries and stop to admire outdoor sculptures. Not far from Pearl is the Boulder Museum of Contemporary Art, where a humble $1 admission belies its thought-provoking, cutting-edge installations. Its next-door neighbor is the Boulder Dushanbe Teahouse, the entirety of which is a staggering display of hand-painted and carved artistry from Tajikistan. It’s a great spot to stop for lunch, if you’re ready to enjoy global cuisine paired with fine teas. Just a few blocks from here is the Boulder Public Library’s Canyon Theater and Gallery, which thoughtfully curates and displays local and regional artists, and sometimes national and international works, too. The CU Art Museum is another option, with excellent rotating selections from their collection of 8,000 pieces. A picturesque drive 15 minutes north will take you to the Gunbarrel neighborhood. Here, you can tour Celestial Seasonings, one of the largest tea companies in North America. Their free tours showcase factory innovation, a gallery displaying the illustrations that go on their tea boxes, and a lovely gift shop is filled with artful finds. Ready for a refreshment? Learn about the art of beer on a tour at Avery Brewing Company, and stop to give your feet a rest in their gleaming tasting room. Dinnertime calls for an inspiring setting and creative cuisine. Try Zolo Grill for Southwestern fare with zest, while you sink into colorful banquets under a ceiling of raw timbers. Or admire the interior-design prowess exhibited at Salt or Wild Standard — cozy and rustic with farm-to-table dishes that will have your mouth watering. If you happen to be in town on a First Friday, you’ll want to participate in the NoBo Art Walk, a self-guided tour of artists’ studios and creative businesses in North Boulder. Along the way, you may meet upcoming artists, hear live music and nibble on hors d’oeuvres. (Look for the NoBo Information Tent in front of Ace Community Art Gallery). The live music in Boulder is amazing, and a great spot to catch a concert is the historic Boulder Theater. Also plan to check the Dairy Arts Center calendar before you arrive to purchase tickets to a dance or theater performance. The newly remodeled space is where much of Boulder’s art scene takes place, with galleries, stages and 11 resident arts groups. The Dairy’s Boedecker Theater (or “The Boe” to locals) shows art-house flicks, streaming live opera and ballet performances, and documentaries every night of the week. 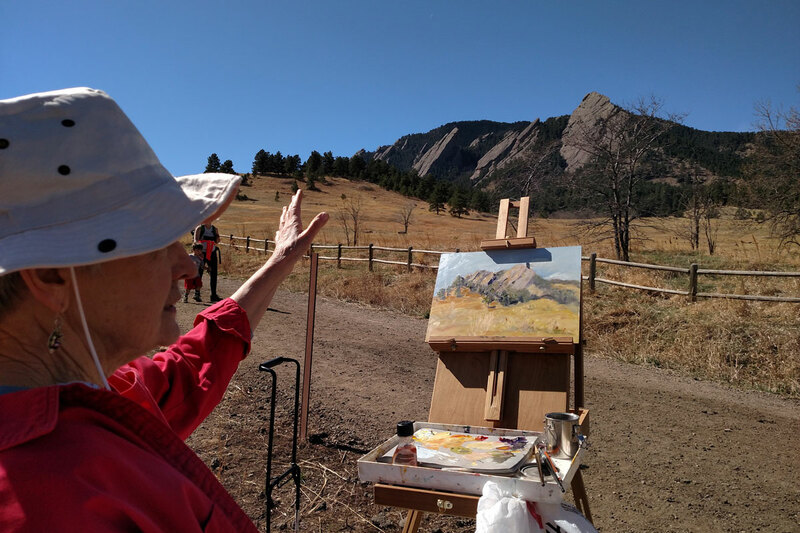 Boulder’s art events happen year round and include the fall Open Studios tour, Boulder Arts Week in the spring, Colorado Shakespeare Festival and Colorado Music Festival in the summer, the Boulder International Film Festival in the winter, just to name a few. Find a list of major annual events here.